Martin Freeman reveals his first encounter with Gollum in The Hobbit! A Community star might be in the new Evil Dead. What do action figures reveal about the plot of The Dark Knight Rises? 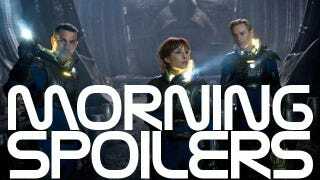 Damon Lindelof breaks down the Alien connections in Prometheus. Plus lots more on Bryan Fuller's Munsters reboot! I did get to throw Tony Stark [Iron Man's alter ego] through a window - which you can see in trailers — all I can tell you is he deserved it. He's got a sharp tongue, that Tony Stark. I had the privilege of throwing Robert Downey Jr. out of a window. So, it's pinch-me moments all the way. "It's accomplishing what we set out to do. I wish that we didn't have to be so mysterious about it but mystery can be a good thing as long as you've got the goods to back it up. In this case, when the movie arrives, one of the most visionary filmmakers in the history of cinema will be putting his cards on the table and I'm just kind of standing behind him with my arms folded." "The satire element of RoboCop is, I think, needed today. That kind of social, aggressive satire I haven't seen done well in movies lately. And it's almost like the politics and violence in the world is asking for this: 'Someone please make some satire now!' So we're going to keep that edge." "The first thing I filmed was finding the ring in Gollum's cave. It's good to know, but not play, the importance of the Ring. I'm trying to put a bit more heaviness into it. It's not all comical." "It was great for Martin to start off with that chamber piece. He could find Bilbo within the confines of a one-on-one scene. It was almost stranger for me: for the first couple of days it felt like I was doing an impersonation!" "In the normal run of things, there'd be quite a lot going on for me. I've got ears, the wig and the feet, which three more things than an actor normally has… But then I look over at the dwarves and see what they're lugging! They're absolute troopers." "Jack the Giant Killer" tells the story of an ancient war that is reignited when a young farmhand unwittingly opens a gateway between our world and a fearsome race of giants. Unleashed on the Earth for the first time in centuries, the giants strive to reclaim the land they once lost, forcing the young man, Jack, into the battle of his life to stop them. Fighting for a kingdom, its people, and the love of a brave princess, he comes face to face with the unstoppable warriors he thought only existed in legend-and gets the chance to become a legend himself. Here's a high-res version of the cast promo photo that was released a while back. Also, we now know the movie's release date is May 11, 2012. Here are some promo images for the sequel to Journey to the Center of the Earth, which will be released February 10, 2012 in 2D, 3D, and IMAX. We have gathered to discuss the storylines and themes of Season 5, and scripts for the first half of the season are being written. We are preparing to shoot Episode 1 right now...I've read episodes 1 and 2, and I'm very excited about them...Some of the things that people loved in the first four seasons of ‘True Blood,' you'll be getting more of. And there will also be some surprises that will hopefully delight everyone. We have a sense of what the fans have already enjoyed in the previous seasons, and we're doing our best to give our fans more of that but also leave some room for novelty and surprise. AN ESCAPED FUGITIVE'S MURDEROUS RAMPAGE LANDS AT NICK'S FRONT DOOR — An escapee returns to Portland seeking revenge against those who put him behind bars. His unusual strength and high tolerance for pain makes Nick (David Giuntoli) take notice. As the case escalates Nick and Juliette (Bitsie Tulloch) are put in danger, and Monroe (Silas Weir Mitchell) is called into action to help put an end to the convict's deadly rampage. Think Dawson Leery's compassionate, all-supportive dad (from "Dawson's Creek") crossed with Frankenstein's monster. Was created by Grandpa; no other man, besides one he puts together, would of course be good enough for his daughter Lily. Doesn't much look like Fred Gwynne's Frankenstein-looking fellow from the original. This Herman is more of a stud – albeit one with scars. He's a skinny, but rather attractive man in his '30s – though he's stitched together from the body parts of other men and has a mechanical steampunk heart – one that is breaking down. Though Herman does get a heart replacement – thankfully a few of those ‘dead hobo's' turn up under the swimming pool – he's not doing well (he loves too much and it's killing him). Believing he has no choice if he wants Herman to live, Grandpa finds a nice man with a "good heart" for Herman (if you get my drift). A big old softie that adores his family, Herman is his son's best friend and has a passionate relationship with the Mrs.